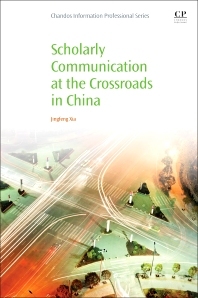 Scholarly Communication at the Crossroads in China follows the dichotomy paradox to focus on both achievements and challenges at every step of the scholarly communication process, highlighting Insights and trends in academic infrastructure and scholarly behaviors within the context of local economic, political, and technological development. Since China adopted an open-door policy in the late 1970s, it has experienced a dramatic economic transformation. With a growth rate around 10% over the past three decades, China is now the second largest economy by nominal gross domestic product and by purchasing power parity in the world. Economic success has impelled restructurings in almost all aspects of the social and cultural settings. Among other changes, the new pursuits of education, research, and scholarship have redefined the academic community with its development across generations and ideologies. Chapter 2: Creation and Dissemination: How? Chapter 5: International Collaborations: What? Dr Jingfeng Xia is the Dean of the Library and University Collections, East Stroudsburg University of Pennsylvania, USA. Previously he worked at the University of Arizona and the University of Florida Libraries. He has published extensively on scholarly communication, applications of Geographic Information Systems (GIS) in library management, and digital repositories.